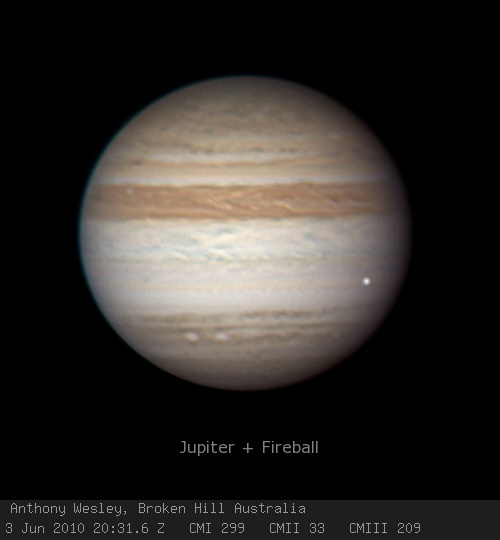 Geology in Motion: Jupiter hit Again! It was initially a bit difficult to track this one down, but two amateur astronomers caught an impact on Jupiter on video. A report from the Philippines said that the impact was around 4:30 a.m. on Friday, June 3. The other amateur astronomer who captured this on video was the Australian, Anthony Wesley, who caught the 2009 impact. The Philippino, Christopher Go, estimated that the fireball flash lasted about two seconds. His story is nice--a guy whose imagination was fired up in 1986 by Halley's Comet. Now 39, he continues working from his home. He discovered the second red spot on Jupiter known as "Red Jr." It appears that credit for the discovery will go to the Anthony Wesley and that Go's video will be the confirmation. The impact flash is the white dot at 4:00 in this image. The video and more details can be found here.